Practicing Zen means zazen. A quiet place is most suitable for doing zazen. Place a thick mat on the floor. Do not allow drafts or mist to enter the room. Do not allow rain or dew to leak in. Protect the place where you sit; keep it in good condition. Ancient sages sat on the diamond seat or on a large rock. They all laid grass thickly and sat on it. Keep the place where you sit well-lit. It should not be dark either during the day or at night. It is essential that it be warm in winter and cool in summer. Let go of all relations, and set all affairs at rest. Do not think of good, do not think of evil. Zazen has nothing to do with the function of intellect, volition, or consciousness, nor with memory, imagination, or contemplation. Do not seek to become a buddha. Be free from the discrimination of sitting and lying down. Be moderate in drinking and eating. Do not squander your time. Be as eager to do zazen as you would be to extinguish a fire upon your head. The fifth patriarch on Mt. Obai (Huang-mei) practiced nothing but zazen. 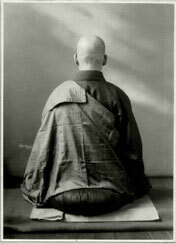 When you do zazen, wear a kesa (kashāya), and use a zafu (cushion). The zafu should not extend completely under your legs, but should be placed just under your buttocks, so that your legs are on the mat, and your spine is on the zafu. This is the way that the buddhas and patriarchs sit when they do zazen. You may sit in either the half-lotus or the full-lotus position. When you sit in the full-lotus position, put your right foot on your left thigh, and put your left foot on your right thigh. The line of your toes should be even with the outer line of your thighs. When you sit in the half-lotus position, just put your left foot on your right thigh. Keep your clothing and kesa (kashāya) loose, but neat. Place your right hand on your left foot. And your left hand on your right hand palm. The tips of your thumbs should be lightly touching. Position both your hands as above, and put them close to your body. The tips of your thumbs should be aligned with your navel. Sit upright in the proper position. Lean neither to the left nor to the right, neither forward nor backward. Your ears should be in line with your shoulders; your nose in line with your navel. Place your tongue against the roof of your mouth. Breathe through your nose. Your lips and jaw should be closed. Keep your eyes open, but neither too widely nor too narrowly. Adjust your body and mind in this way; then exhale fully and take a breath. Sit stably in samadhi. Think of not-thinking. How do you think of not-thinking? Beyond-thinking. This is the way of doing zazen in accord with the dharma. Zazen is not learning meditation. Rather zazen itself is the dharma-gate of great peace and joy. It is undefiled practice-realization. 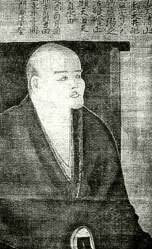 Shōbōgenzō Zazengi, the eleventh volume.